I’ve always been a big fan of Wes Anderson and love the largely idiosyncratic world his characters lived in. However, Bottle Rocket was the one Wes Anderson film I couldn’t quite get into. Maybe it was because it was my first exposure to Anderson when I first saw it, but I found it to be overly quirky and a bit disorienting. Watching it again, on the other hand, has completely turned my opinion around and I now will admit I severely misjudged the film before. It’s a dazzling, wickedly funny take on the crime genre. The opening of Bottle Rocket has the feel of what the rest of the picture is like. Anthony (Luke Wilson), a lowly twenty-something underachiever from Texas, departs from a mental asylum in Arizona with his best friend Dignan (Owen Wilson). Dignan ties up some bed sheets and tosses it out of their two story building, acting as if their escape was a scene from a prison movie. Their whole mission though is aimless as the institution can allow them to leave. After this, Dignan tells Anthony about a 75-year life plan he’s been working on, which involves them pulling off a heist and working under a high-time criminal played by James Caan, who runs a lawn mower business to keep his cover. The duo hire their friend Bob (Robert Musgave) as their getaway driver, mostly because he’s the only one they know who owns a car. After the big heist, Anthony, Dignan, and Bon go on the run. 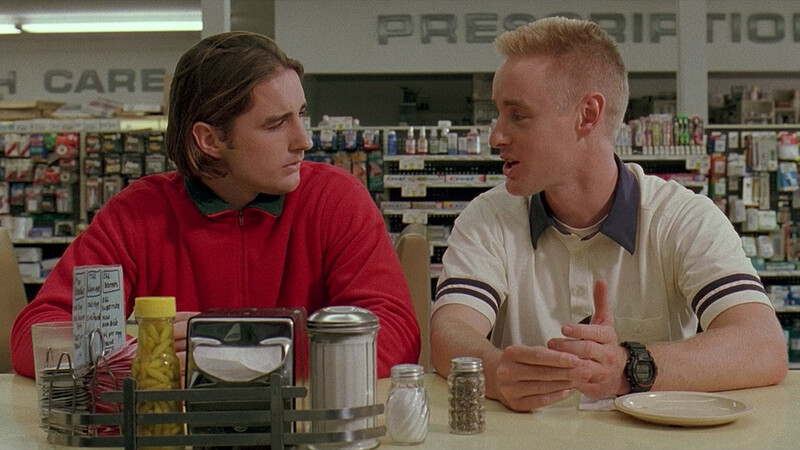 The humor of Bottle Rocket generally derives from the characters not realizing how petty their crimes and actions are, particularly after the brother-relationship between Dignan and Anthony (which probably works so well since actors are actually brothers). Bottle Rocket also sets up many traits that have appeared on other Wes Anderson movies. Anderson’s ensemble of eccentric characters appear as well as his perspectives from children and wildl sixties soundtrack. His directing style is also clearly evident from his bird’s eye-view shots to his camera stylization. While not quite as colorful as his other movies. A rampant and very entertaining comic romp, almost like an update on Raising Arizona, Bottle Rocket is full of exuberance and energy. While Anderson’s craft improved later years (his sophomore effort Rushmore still is my favorite by him), it shows a great start for a great director. Great read. I love Bottle Rocket! Thanks! Love it as well. I haven’t seen an Anderson movie I didn’t like. I like the Anderson films I’ve seen but not caught this one yet. Nice one Charles. Thanks! If you like Anderson’s style, I think you’ll enjoy this. This is my favorite of his films. Thanks for the comment. Rushmore’s my favorite, but all of his movies are great. I’ve only seen this film once and my initial take was very similar to yours; good, but not great. I will have to revisit in the near future and see if it improves upon second viewing! Thaks for the comment. Definitely try checking it out again, it improves after multiple viewings. Bottle Rocket was a respectable debut, but Anderson really his stride with his next film Rushmore. Thanks for the comment. I agree, Anderson improved much more with Rushmore, which is my favorite of his filmography. Great effort my friend, cracking review. Thanks! Wes Anderson always delivers. Ah! Glad to hear you change your opinion on this one, man. I often find that it takes a lot of criticism in comparison to Anderson’s other work but its still a fantastic little film. Thanks! I agree, it’s a great little movie. Not Anderson’s best, but a very good debut. This is the only film by Anderson I haven’t seen yet – I need to get round to it at some point. Nice review. Thanks! I recommend checking this out. It isn’t Wes’ best, but it’s very fun and enjoyable.